“INDEPENDENT AUTHORS” – PRESENTED BY BAG&BAGGAGE ARTS AND CULTURE DISCUSSION SERIES – SEPTEMBER 6, 2018. Bag&Baggage is proud to present a new arts and culture discussion series! B&B A&C will bring together diverse artists from a range of cultural industries to discuss their work, their challenges, and their influences. B&B A&C is free to the public! Our first installment is “Independent Authors,” and will feature four local authors who have made a career self-publishing their work. The first event will include short readings from the author’s works followed by a discussion and Q&A session about the independent author and publishing industry. If you’ve ever wondered if you could write and sell your own books, this is a great introduction to the industry with special insights from local writers and editors who are making the magic happen! The 9th Annual Lend an Ear, Come and Hear reading event is July 7, 2018, at Plum Hill Winery in Gaston, Oregon. It begins at 10:30AM and goes to approximately 1PM, and is produced by Writers in the Grove. Due to the the Martin Luther King Holiday, the Forest Grove Senior and Community Center will be closed. 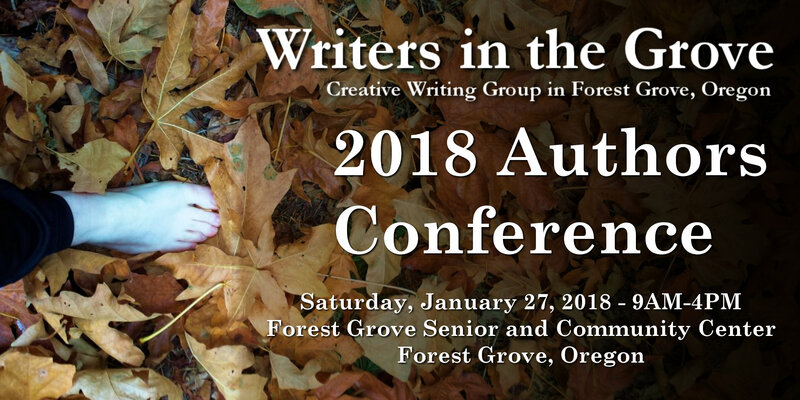 Writers in the Grove will be meeting at the home of Paula and Parks Adams in Forest Grove. Please contact us if you need the address. The annual Science Fiction/Fantasy Story Weekend with Wordcrafters writing group in Eugene, Oregon, is April 13-15 in the mountains along a river in the Oregon Cascades. The weekend is limited to 15 participants and you will be staying in lovely 3-bedroom cabins with others members of the team. There is time for gathering and solitude for writing. The group is lead by Nina Kiriki Hoffman, author of adult and YA novels and more than 250 science fiction and fantasy stories. Disclosure: I attended this even a couple years ago and had a wonderful time. I would be going again if it didn’t conflict with another activity. I highly recommend it. Nina takes time to spend with each person once or several times throughout the weekend to hep walk you through your writing challenges, plot, the “science,” and offer any help you need with your writing. Other frequent attendees are also well-published and experienced to help you through your writing process, but don’t let that intimidate you. There are writers at all levels of experience attending, all there dedicated to the writing process.